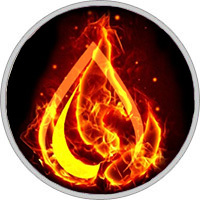 The element of Fire is associated with the signs Aries, Leo and Sagittarius, and it also rules the First, Fifth and Ninth Houses. As one would expect, those graced by Fire are fiery, indeed. They are enthusiastic and sometimes larger than life. Just like a fire that is left untended, however, Fire signs can burn out of control - so it’s best to tend those embers. A Fire sign is also an indicator of creativity. This element manifests itself in creative and unique ways, and those in its glow are wonderfully courageous and lively spirits. Those influenced by a Fire sign are self-sufficient, spontaneous and possess a tremendous zest for life. It also stands to reason that a combustible Fire signer would be ardent in the game of love. Yes, these are the sexiest signs of the zodiac, knowing they are the cat’s meow and climbing ever higher in the name of love. To their credit, those touched by Fire are often an inspiration to others, certainly for their adherence to solid moral and religious ideals. If there’s a flip side to the element of Fire, it can be that those who bear its will can be overly strident in getting their way. Call them bossy, even. These folks can come across rather forcefully. Selfishness and an overdeveloped ego can also be seen as part of a fiery individual’s shadowy side. Fire signs are strong, self-assured, creative and fun. When they get too hot to touch, though, it may be a good idea to stand back! Mars ruled Aries is cardinal fire. Any planet in this sign becomes a bullet — red-hot, impulsive, and ready to go. Aries planets are not known for their patience. In fact, they hare waiting more than anything. There are no obstacles in the mind of an Aries planet. There’s only where they are and where they want to be, and the shortest distance between those two points is a straight line. Aries planets prefer cutting to the chase over any other tactic. They boldly charge in where few would dare to go. They are brave, courageous, impetuous, and direct. Your Aries planet will always be exactly what it seems to be. This is the first sign, so Aries planets are often very good at initiating projects or starting things up. They aren’t as eager to finish, though. That’s more of a fixed quality, so projects often are left undone. Aries planets need a physical outlet for their considerable Mars-powered energy — otherwise their need for action can turn to stress. Exercise, hard work, and competition are excellent outlets for the active energy of Aries and Mars. Sun ruled Leo rules over pride and the ego. Leo planets want to shine, and you can use them to perform if you own them. In fact, you should find a stage, take the center spot, and get used to it, because, like it or not, your Leo planets will attract attention even when they don’t necessarily want it. After all, Leo is fixed fire. Fortunately, Leo planets are only too happy to reciprocate any attention they receive. They’ll repay the adoration of their fans a thousand times over with lavish compliments, lovely gifts, and wonderful, creative outings designed especially to amaze and delight. Leo’s specialties are entertaining, having fun, and making big entrances and exits. Planets in this sign love drama. Since the Sun is the center of the solar system, occasionally your Leo planet may forget others are out there or that not every action is planned with them in mind. In other words, they can be a bit too touchy and "high-maintenance" at times. Above all else, Leo planets cannot help but live to be loved and appreciated, and they’ll gather up any attention that comes their way. This third fire sign is ruled by Jupiter, the largest planet. It’s mutable fire, so its enthusiasm can spread at times like a brush fire. Scattered? Well, maybe. This sign is out to experience everything life has to offer. Sagittarius planets tend to have terminal case of the grass-is-greener syndrome. They are adventurous, bored by routine, generous, and optimistic to a fault. They can also be excessive, tending to overdo and overindulge. These planets adore foreign places, foreign people, maps, and outdoor activities. They’re not known for neatness or for accepting just a sliver of anything. They’re only too happy to preach, advertise, philosophize, and learn by having the big picture explained. Sagittarian planets are also quite prophetic at times, since Jupiter is the planet that rules higher learning. They absolutely believe in the power of laughter and aren’t above embarrassing themselves to make someone laugh.